This article discusses Canadian Drinking and Driving legislation and its interpretation by the courts since the Canadian Charter of Rights and Freedoms was proclaimed in 1982. It is intended as overview for the layperson and not as an authoritative academic discussion of the subject. Anyone seeking a more comprehensive understanding of drinking and driving law in Canada may access, free of charge, The Criminal Code of Canada, legal academic writings and Canadian court decisions on the topic at the free website of the Canadian Legal Information Institute at www.canlii.ca. The law in this area is technical and complex and anyone charged under this legislation is unlikely to obtain success without the assistance of a lawyer. Any commentary about the state of drinking and driving law in Canada is the opinion of the authors alone. In 1985, three years after the enactment of the Canadian Charter of Rights and Freedoms (but based on facts that arose before the Charter was signed), the Supreme Court of Canada, in the split decision of R. v. Dedman, approved random stops of motorists for highway traffic purposes. Dedman was followed by R. v. Hufsky, in which the Supreme Court ruled that random vehicle stops do violate the Charter right not to be arbitrarily detained. Unfortunately, the Court also ruled that the violation was justified, under section 1 of the Charter, to promote highway traffic safety. Random vehicle stops were therefore constitutional. Few court decisions, if any, have had a more profound and far reaching effect on the lives of millions of ordinary Canadians. Hufsky is nothing less than the wholesale abolition of the right of Canadians not to be arbitrarily detained when in their motor vehicles. These cases eventually led to the judicial conclusion that Charter rights do not apply to the act of driving at all. Indeed, within a decade of Dedman, the adage “driving is a privilege, not a right” was a judicial mantra and the starting point of each and every analysis of legal disputes concerning the act of driving. Judge Egbert’s unthinkable has become the law of Canada. The categorization of driving as a privilege rather than a right has had at least three momentous consequences for Canadian residents, the majority of whose lives, in one way or another, are intertwined with the automobile. First, the act of driving in Canada is, as Judge Egbert feared, indeed now abided only at the whim of the humblest of state officials, whether bureaucrat or junior traffic officer, without regard to guilt or innocence. This is vividly illustrated by provincial licensing legislation in Ontario (and most provinces and territories) automatically suspending one’s driving license, at the roadside, for 90 days, upon merely being charged with a drinking and driving offence. This extraordinary legislation was declared constitutional by the Ontario Court of Appeal in the 1999 case of Horsefield v. Ontario (registrar of Motor Vehicles). Since driving a motor vehicle is a mere privilege, the Court reasoned, the presumption of innocence, the most fundamental and sacred right in the criminal law, did not apply. There is no entitlement to fairness. By the same logic, legislation in various provinces, including Ontario, grants a traffic officer authority to suspend, on the spot, a driver’s license for blood alcohol levels below the Criminal Code legal limit (when a roadside screening device registers a “warn” rather than a “fail”). The Supreme Court is expected to consider this issue some time in 2015 in the case of Lee Michael Wilson v. Superintendent of Motor Vehicles, et al. case 35959. Based on past judicial practice, it is difficult to be optimistic that recognition will be finally given to the true importance of the ability to drive in Canada. In the roadside scenarios, the potentially catastrophic punishment of license suspension is imposed without trial or exceptions to permit vehicle dependent employment to continue, irrespective of any defences to the charge that may exist such as testing equipment malfunction, false positives, mistaken or dishonest police work. All defences are irrelevant. Indeed, innocence itself is irrelevant. The license suspension may be unfair, unjust, completely illogical and without merit. The ability to drive may be critical to the financial viability of the motorist’s family. None of this matters, our courts have ruled, because the ability to drive in the 21st century, like reserving the corner seat at your favourite restaurant, is a mere privilege. The Orwellian end result of this way of thinking is exemplified in legislation in most provinces and territories, including Ontario, permitting license suspension for activity (or non-action) that is entirely unrelated to the act of driving itself. For example, one’s license can be suspended, again, without notice or hearing, for an allegation of non-payment of child support. Some judges have instinctively railed against the manifest injustice of this law only to be quickly silenced by higher courts. See, for example, Paynter v. Henderson  M.J. No. 272. The second consequence of denying the status of right to the act of driving is a post-conviction punishment regime which emphasises driving prohibition rather than the traditional criminal law sentencing remedies of restitution, fine, probation or jail. 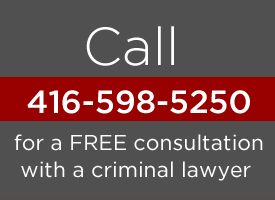 A first time conviction for a drinking and driving related offense in Canada triggers a mandatory one year driving prohibition (concurrent to provincially imposed license suspension). Subsequent convictions carry longer mandatory driving prohibitions. This punishment scheme is morally and logically flawed. First, it discriminates against Canadians for whom the ability to drive is essential to daily survival. Stories abound among defence lawyers of marriages broken, homes lost and families bankrupted because the breadwinner has been rendered unemployable as a result of a driving prohibition, often for a fleeting error in judgment, sometimes in the absence of any actual impairment at all. In sentencing criminal offenders, Canadian judges have traditionally attempted to fashion sentences that preserve the offender’s ability to work and thus his self-worth and value as a contributing member of society and, most importantly, the security of his dependents. No such latitude is available to Judges when it comes to those convicted of a drinking and driving offence. Logical analysis suggests that a driving prohibition is a poor general deterrent against drinking and driving. Those who do not need to drive are not likely to be dissuaded from drinking and driving by the prospect of a driving prohibition. For such individuals, being unable to drive is a mere inconvenience and, therefore, a weak deterrent. An office worker can take the bus to work; the wealthy can hire a chauffeur. In addition to being discriminatory, the current sentencing regime fails to deter many who might be inclined to break this law. The havoc caused by drunk drivers cannot be denied. However, we do not suspend the fundamental rights of alleged murderers, drug dealers, robbers or those who illegally carry firearms. Why is the wholesale suspension of rights acceptable for alleged impaired drivers? Would we think it fair to prohibit the carpenter from using his hammer or the chef his knife, even if those tools were alleged to have been used in a crime? Yet, often for single or technical error in judgment, our courts have told the cabbie, the courier, the truck driver, the linesman, the farmer, the transit worker, the heavy equipment operator, the travelling salesperson, the rural resident and millions of other Canadians who depend on the automobile to survive, that their right to work or move about is unworthy of the protection of the law. It may well be that sometimes, in the case of repetitive offenders for example, a driving prohibition as a term of bail or as condition of a sentence may be an appropriate and necessary societal protective measure. As an across the board automatic remedy, however, driving prohibition is a blunt, unfair and unsuccessful sentencing technique. Traditional sentencing tools such as restitution, probation, community service and incarceration, imposed after a fair investigation and trial are a far more effective general deterrent that lacks the taint of injustice and discrimination that permeates our current legal framework for the management of motor vehicle crimes. The third consequence of undermining fundamental rights in relation to the act of driving has been a wholesale devaluation of the rights of anyone who happens to be in a motor vehicle, whether driving or not. While early cases like Hufsky emphasized that the suspension of the arbitrary detention right was justified only to address highway traffic safety concerns, the courts have not held true to this promise. The development of the “dual purpose” motor vehicle stop case-law, which permits a police officer to stop a motor vehicle for any purpose as long as one of his purposes is related to highway traffic regulation, has led to abuse of Charter rights on a grand scale (see R. v.Nolet, 2010 SCC 24 for the most recent Supreme Court pronouncement on this issue). Canadian police officers, whether on traffic patrol or not, have developed a keen concern for dirty license plates, tinted windows, rolling stops, failures to signal and confirming vehicle documentation. Despite earlier assurances to the contrary, our courts have enthusiastically accommodated abuse of the highway safety rational for random motor vehicle stops to enable groundless criminal investigations that have nothing whatever to do with highway safety. The practice is now routine. The resulting vehicle searches and arrests have generated countless hours of court time spent litigating the details of police and occupant conduct after a vehicle stop. Thousands more “highway traffic” stops, occupant interrogations and improper searches never see the light of a courtroom because no crimes are discovered by investigating officers. The characterization of driving in Canada as a “privilege” has come at an unacceptably high price—the defeat of Charter protections on a massive scale. The notorious “driving while black” vehicle stops, as one example, are the progeny of Dedman and Hufsky. First, it cannot be overstated that the application of the drinking and driving laws is complicated and technical. This summary is intended to provide the lay reader with an introduction to the legislative framework and to discuss, in general terms, the means by which the charges can be defended. It is folly for any layperson to attempt to represent him or herself on a driving under the influence allegation. A lawyer familiar with this area of law should always be consulted about the specific facts of your case before meaningful advice can be given. The core drinking and driving offences are recited in section 253 of the Criminal Code of Canada. The statutory regime also deals with the issue of impairment by drugs. This topic, a subject that will be discussed in a separate article, is not discussed here. The motor vehicle need not be moving or the motor running. If one is in care or control of the motor vehicle, one is liable under the provisions whether the vehicle is motion or not. The concept of care and control has been much litigated but, at a minimum, being seated in the driving seat of a vehicle will usually be considered care and control. Indeed, once it is established that one was in the driver’s seat, a presumption of care and control exists. The onus shifts to the defendant to prove that he or she was not occupying the driver’s seat for the purpose of setting the vehicle in motion. There are innocent reasons why one may be in the driver’s seat of a vehicle while impaired, such as sleeping, charging a phone or trying to stay warm while waiting for a tow truck or a sober driver to render assistance. Advancing a defence to care and control can nevertheless be challenging. New technology has created additional barriers. With the option of keyless start, for instance, it is more difficult to exclude the possibility of inadvertent activation, even if the keys have been kept well away from the ignition. The impaired and blood alcohol concentration offences are independent of each other. If a driver is found to be “over 80,” which requires administration of a breathalyzer test, the offence is made out even if there are no signs of impairment whatsoever. Conversely, a driver can be found to be impaired even if there is no breathalyzer evidence of the blood alcohol concentration or, indeed, even if the blood alcohol concentration is below the legal limit. At various stages during an investigation, a police officer may make a demand of a driver to provide a breath sample, either into a roadside screening device or a breathalyzer machine at the police station. Refusal to comply, without reasonable excuse, with a police officer’s demands in this regard, is itself a separate criminal offence with the same penal consequences as driving while impaired or with excess blood alcohol concentration. You have a right to speak to a lawyer before submitting to a breathalyzer test but not, usually, at earlier stages of a police investigation. In particular, there is ordinarily no right to speak to a lawyer prior to providing a breath sample into a roadside screening device ( the quick tests commonly administered at RIDE program stops). For a first conviction of impaired driving, driving with a blood alcohol concentration beyond the legal limit, or refusing without reasonable excuse to comply with a demand to provide a breath sample, the minimum sanction is a fine of $1000. For a second offence, a 30 day jail sentence is mandated and for a third, a 120 day jail term is the minimum sentence that can be imposed. Concurrent provincial legislation also calls for automatic driving license suspension upon conviction for a Criminal Code drinking and driving offence. Moreover, the Ministry of Transportation, rather than the Court itself, is often the final arbiter of the period for which the person convicted cannot drive. For instance, if a plea to a second offence is negotiated where the Crown does not file notice of a mandatory sentence and the judge imposed a one-year suspension, the Ministry will likely not conform to that order but instead suspend the license for at least as long as the period mandated by the Criminal Code tariff of two years. The ignition interlock program is one small concession government has made to the reality that many working people must drive to earn a living. Having said that, it is doubtful that sensitivity to the working bloke, as opposed to the desire to reduce the number of trials by encouraging guilty pleas, is what motived the program. Available in Ontario to first time offenders only, this program shortens the mandatory minimum driving prohibition period from one year to either three months or six months, depending on how the program is accessed. For the remainder of what would have been the full prohibition period, the offender may drive if an ignition interlock device is installed in his or her personal vehicle. This apparatus is essentially a mini-breathalyzer hard wired into the vehicle. The offender must test his or her breath before starting the vehicle. In the event of a fail, the device prevents the vehicle from starting. To be eligible for the program, one must have been convicted of an impaired driving offence under s. 253, 254 or 255(1) of the Criminal Code and have had their driver’s license consequently suspended. The underlying offence must not have involved drugs, must not have resulted in death or injury, and must not have taken place while the offender was already subject to an ignition interlock licence condition. The offender must not have been convicted of drive while disqualified within five years of the new offence taking place, must not have previously been granted a reduction to 10 years of an indefinite licence suspension, and must not be subject to a court order barring participation in the program. There are two streams under which one may qualify for and participate in the ignition interlock program. Under “Stream A,” one’s license is suspended for three months after conviction. After the three months have passed, the ignition interlock system must be installed and used for a further nine months. To qualify for “Stream A,” one must enter a plea of guilty to the underlying drinking and driving offence and be convicted and sentenced within 90 days of the offence date. An assessment program must also be successfully completed within the three month license suspension period. Since admission into “Stream A” requires pleading within a short period of time after being charged, those that need to drive are left in the unfortunate position of rushing into an ill informed decision with potentially far reaching consequences. They might find themselves feeling compelled to plead guilty without necessarily having full disclosure of the evidence in their case or without having properly retained and consulted a lawyer on the strength of this evidence. The alternative to “Steam A” is “Stream B.” Under “Stream B,” one’s licence is suspended for six months, after which one may drive but only with the ignition interlock system installed and used for a further six months. Everyone that is eligible for the interlock program that does not meet the criteria specific to “Stream A” falls into the “Stream B” category. The ignition interlock program, combined with the provincially imposed automatic 90 day suspension upon being charged with a Criminal Code drinking and driving offence has encouraged an unprecedented number of guilty pleas in drinking and driving cases. As government no doubt anticipated, defendants desperate to drive realized that an immediate guilty plea could have the effect of re-instating the ability to drive immediately after the automatic 90 day suspension on being charged, with no threat of a longer prohibition or license suspension. The basic logic (and sound logic it is) is that, if one will be precluded from driving for 90 days anyway, regardless of guilt or innocence, why not just plead guilty and run the sentence prohibition concurrent to the automatic roadside suspension and begin to drive again at the earliest possible moment? Of course, one can still have a trial; but the risk of conviction and further prohibition from driving can never be entirely avoided. As often happens, elimination of one right, such as the presumption of innocence, renders another, such as the right to a fair trial, irrelevant. What is the point of a trial if punishment is imposed before the trial takes place? This is the cynical approach that Canada has taken with respect to the “privilege” of driving, a privilege without access to which millions of Canadians could not support their dependants or, in the case of rural residents, even leave home. Failure of Crown to prove factual requirements beyond a reasonable doubt, for example, that the defendant was in care and control of the vehicle, that the care and control was at the relevant time or that there was sufficient evidence of impairment or excess blood alcohol concentration at the relevant time. 2. Achieving exclusion of evidence such as breathalyzer results based on scientific evidence that the breathalyzer machine was defective, or that the statutory requirements for their admission to evidence have not been satisfied by the Crown. 3. Achieving exclusion at trial of all evidence of excess blood alcohol and/or impairment (from a breathalyzer machine or any other source such as a police officer’s observations) due to violations of the defendant’s constitutional rights, for instance, the right not to be arbitrarily arrested or detained or the right to consult a lawyer. If convicted, an appeal may be brought. As part of the appeal, the lawyer can seek a suspension of the court order prohibiting driving so that the defendant may drive while waiting for the Appeal to be heard. It cannot be overstated that this area of law is complex and technical. A proper defence usually requires cross examination of seasoned police officers and management of specialized prosecutors and expert witnesses before specially designated judges. This is not an area of law in which self-represented defendants are likely to fare well. Indeed, it is unlikely a layperson would be able to even identify the defences that exist. However, with competent legal counsel, success is often achieved in defending drinking and driving allegations.